So why is an old guy like me so excited about the upcoming Godzilla movie? (Godzilla: King of the Monsters, release date May 31st. Next month!) Okay, I’m seventy-three (going on thirteen), and I’ve always loved monster movies, and I’ll still love ’em when I’m a hundred and three. 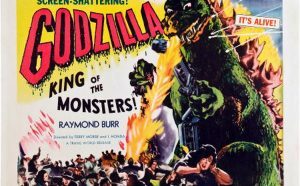 Starting in 1956 with the original Japanese Godzilla movie (they dubbed it in English and stuck Raymond Burr into some scenes for American audiences), I got hooked on all of the Toho Studios monster flicks. The early ones included Rodan (a prehistoric Pteranodon), Mothra (yep, a giant moth), and the three-headed dragon monster, King Ghidorah. Godzilla: King of the Monsters is a sequel to the 2014 film, Godzilla, and the thirty-fifth overall Godzilla movie. (I enjoyed this version, but my favorite is still the much-maligned Godzilla 1998, starring Matthew Broderick. See my post, “Guilty Pleasures: Godzilla 1998.”) It is also the third film in Legendary Pictures’ MonsterVerse, with Kong: Skull Island sandwiched in-between. Some of the actors from the 2014 film will return (Sally Hawkins, Ken Watanabe, David Strathairn), but for the most part it will be a new cast, including Millie Bobby Brown (Eleven) from Stranger Things. Yes, this will be a veritable monster mash! A reunion on a grand scale, if you will. And if this is not enough, 2020 will bring us Godzilla vs. Kong, the fourth film in the MonsterVerse. Can you see why this old kid is so excited? I grew up in the middle of nowhere; we had the big three, plus a faraway PBS on UHF. But sometimes, if conditions were just right, we could get a station across Lake Michigan that played these films all day Saturday. I was always happy on those days. I occasionally wonder what little I would have done had I had an Apple TV/Roku/whatever box and access to many of these films any time I wanted on free streaming sites. Also, yes, of course, television, but had they invented color yet? Jerry, the younger folks today have no clue what we dealt with back in the day…no Netflix, or Amazon Prime or a gazillion TV stations from which to choose, like you said. But somehow we survived. Our television set had a chassis the size of Detroit and a screen the size of a postage stamp. 🙂 And I don’t know if they’d invented color yet, but we sure didn’t have it! Thanks for visiting the site. Ah yes! Million Dollar Movie on WOR TV Channel 9. I must have watched Fay Wray in King Kong a hundred times on Million Dollar movie. Sometimes I got a double dose of King Kong because they would also show it during Rain Out Theater if the Dodgers game was rained out. And who can forget Captain Video and the Video Rangers. Those were the days! Loved the Godzilla movies, all the monster movie. Yes, I watched them all on Million Dollar Movie numerous times. Hey, you only have 3 years on me. LOL Missing Gemora ( the turtle) monster. Looking forward to the latest movie. Leslie, some of those “monsters” were downright laughable. Amazingly, Japanese viewers took them all quite seriously.